Cadence is committed to ensuring that every aspect of your medical device or life science product has been tested, verified, and validated. 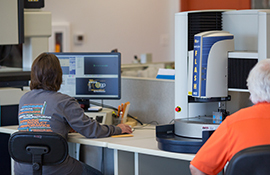 We provide advanced testing and inspection services for our medical device and life science customers to ensure a successful, validated product because there is no room for error. Medical device companies must ensure the safety of patients and device users, which is why medical device testing is critical to the entire medical device development lifecycle. Our medical device testing services are designed to help guarantee that your medical device product responds and functions as it should in the field. We work closely with our customers to make sure that your product meets industry standards and regulations for quality and safety throughout its development process. Our engineering and new product development teams stand ready to help you every step of the way.